Our school tends to get busy on Saturday mornings so please leave early and give yourself adequate time to get to the meet, we will start at 9 am. If the parking lot in front of the track is full, there is a secondary parking lot located off Citrus that you may use. There is additional parking located in our student parking lot off of Citrus St.
﻿For those who are coming from the OC, SD or southern IE please be aware of possible slow downs near the 91/15 Interchange as you make your way up the 15 freeway or east on the 91 freeway to Roosevelt HS. Please give yourself a little extra time as we plan on beginning exactly at 9 am. We have a rolling schedule and will not hold races for those who are late. Thank you for your time and consideration. Want to save time on meet day? Download, print and fill out the form below before you arrive. Please contact Coach Livio at liviocentanaro@yahoo.com for more information. 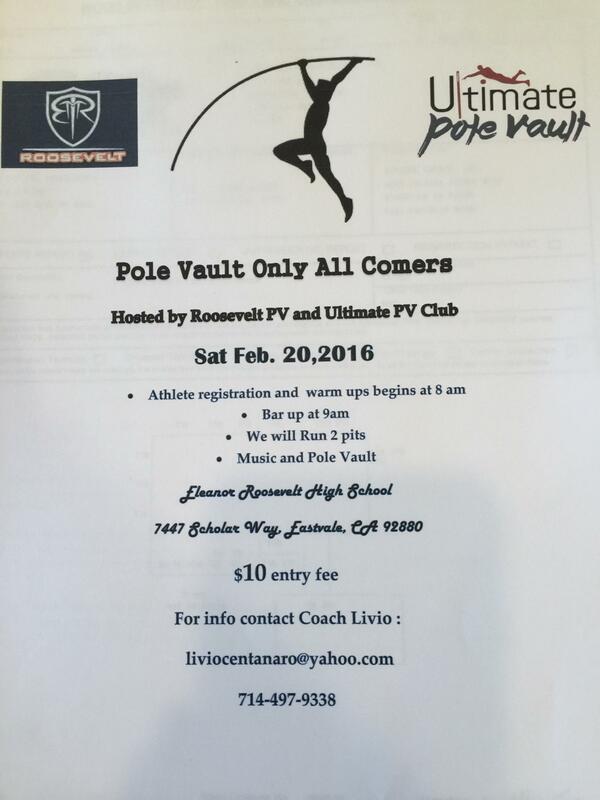 Below are events that are contested at the Roosevelt All Comers (2/13). Below is the order of events. Qualifying heats will run first followed by Open heats. No athletes will be allowed to compete without the proper wristband and ID number/bib.